Can you help? 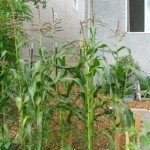 Why can't you grow tomatoes with corn and why have they got to be so far apart? Corn and tomatoes usually need at least 20 feet or so between them. They are often kept away from one another because they are both affected by the same pest, corn earworm/tomato fruitworm.